We do have some questions that require answers. Why did Sara Hailes feel the need to bring up an out of pocket expense claim to the committee? Do they have nothing better to talk about in the meetings! Are all out of pocket expense claims discussed at committee level, or did this one get special treatment? If all out of pocket expense claims are talked about, why are their details not published? Why discuss and publish the figures involved. The charity doesn’t like it’s own finances being published in the minutes and just says “The funds are healthy”. Why not publish that there is a 6 figure sum available in the bank accounts? Be open and transparent about the running of the charity. 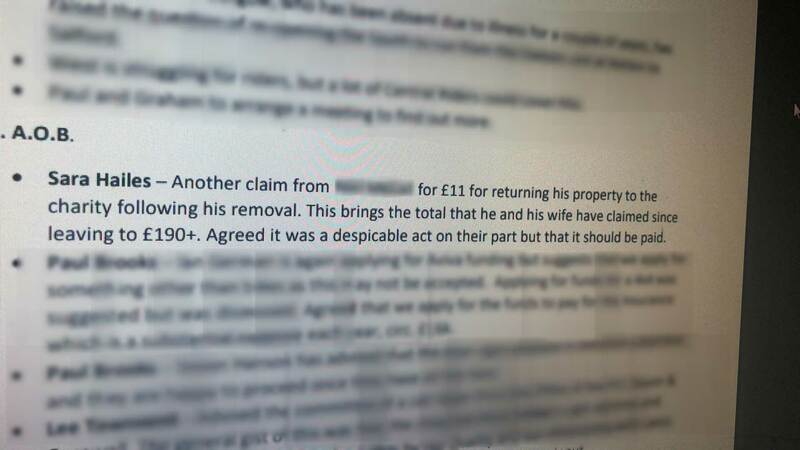 The committee, who “agreed it was a despicable act” said the Payment “should be made”. If this was such a “despicable act” then there must be some grounds to refuse payment. Have the committee just made a payment with no justification? Is Sara Hailes as treasurer authorising payments to be made that are not valid, therefore misusing the charities funds? 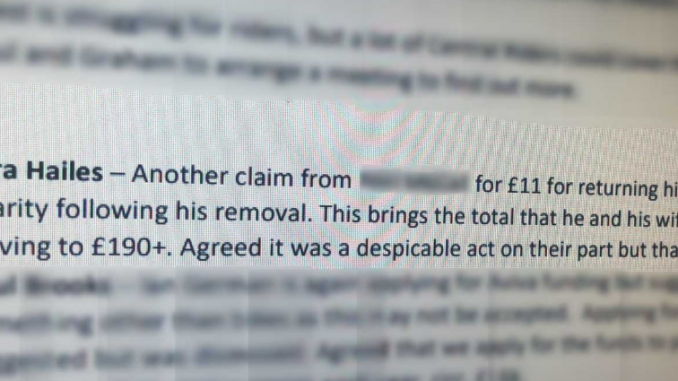 If the “despicable” claim was for genuine expenses, then why is it such a problem for the committee? Are the committee now saying that any out of pocket expense claims are a “despicable act”. Does this mean that when riders claim for their fuel allowances at 20p per mile, that this is also a “despicable act”? Did all the committee agree that this was a “despicable act” or was it just the one or two. Would the charity release that part of the tape recording to us so we can here for ourselves? I think we know the answer to this one, tapes have a habit of going missing or being deleted by employees who have no reason to even be involved in the process as they are not charity members. We have spoken to the person named in the minutes who has told us the following. We will of course invite the committee to comment, but their silence in the past has spoken volumes. This has got us thinking, what other “despicable acts” take place within the charity. Is making monetary payments to yourself a “despicable act”? Is a business planning a fundraising event and asking the charity to cover the costs, and then the event operating at a loss with the business profiting in one way or another a “despicable act”? If you know of any “despicable acts” that take place within the charity or just have a story you would like to share, comment below or email our team at blog@northwestbloodbikes.com. Anonymity is guaranteed.